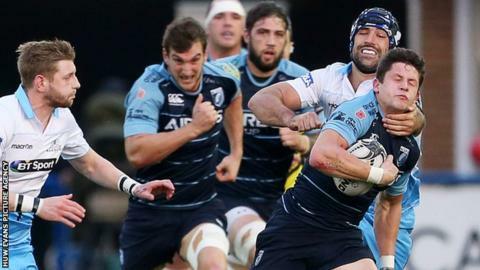 Cardiff Blues plan to cut their squad, putting "quality before quantity", says head coach Danny Wilson. Blues currently have 65 players at senior and academy level, but plan to reduce to a squad of about 38-40 for next season. Wilson said that would not mean the end of Blues players representing Pontypridd or Cardiff RFC in the second-tier Welsh Premiership. "The knock-on effect is a reduction not a complete withdrawal," Wilson said. "There needs to be a reduction in our squad size if we are going to go for quality over quantity. "But will players still play for Pontypridd and Cardiff? Of course they will." Former Wales Under-20 head coach Wilson left his position as Bristol forwards coach to join Blues in June 2015. Blues have won only once in the Pro12 this season and Wilson described aspects of the recent defeat by Zebre as "diabolical" and "embarrassing." "The long-term plan we are piecing together at Cardiff Blues is that we need a quality squad," Wilson said. "We've got a lot of quality at the Blues but we probably need to add to that. "I think we'll do that by spending our money slightly differently in terms of recruiting quality rather than quantity."